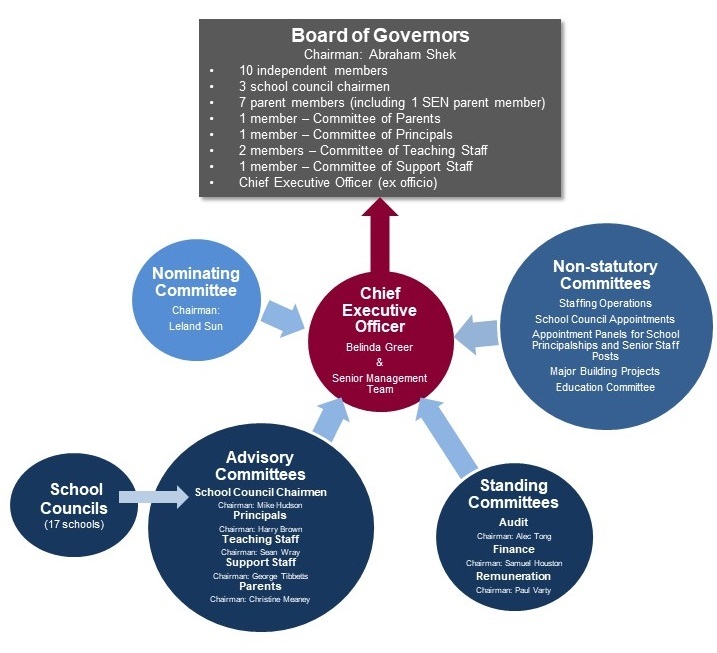 ESF has a strong and balanced governance structure that effectively enables a variety of stakeholders to participate in the decision-making process. The Board of Governors has overall responsibility for managing ESF’s affairs, maintaining its educational standards and administering its property portfolio. Its principal functions include working with the Chief Executive Officer to establish strategic direction, review the overall curriculum strategy for all schools and ensure the efficient use of resources. The Board is responsible for ensuring effective communication between parents and staff and for maintaining procedures for the recruitment, retention, management, development and support of all employees. Its responsibilities also include selecting and appraising the performance of the Chief Executive Officer and approving the appointment of all senior staff. The Board is supported by a number of committees, including standing committees for Remuneration, Audit and Finance. The Board of Governors is broadly constituted and includes ten independent members, seven directly elected parent members, one Committee of Parents Governor, three School Council Chairmen, four members of staff (including a principal) and the Chief Executive Officer (ex officio). Click here to view the current membership of the ESF Board of Governors. Each ESF primary, secondary and private independent school has a school council in accordance with the resolutions of the Board of Governors. Within this framework, the main responsibilities include working with the Principal to establish a strategic direction, approving the curriculum, ensuring that the needs of students are met and approving the annual budget. School councils are also responsible for approving senior appointments, implementing effective procedures for staff management and development and, most importantly, appraising the performance of the Principal. Each school council which comprises a Chairman and representatives of parents, teachers, support staff and the wider community, as well as the Chief Executive’s representative.